The Red Dog property is entirely enclosed within NorthIsle’s 100% owned claims. It was acquired by option for its potential to provide higher grade mineralization to a mining operation in the Hushamu area. 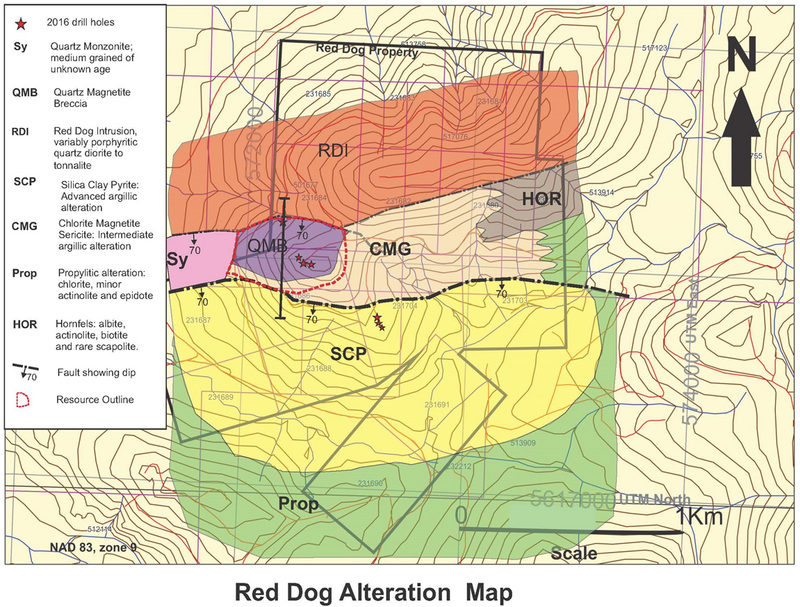 The Red Dog Property hosts a current indicated resource of 23.6 million tonnes grading 0.32% Cu and 0.46 gpt gold associated with a quartz breccia developed adjacent to a quartz feldspar porphyry intrusion. A large area of high level advanced argillic alteration measuring over a km in diameter occurs south of the quartz breccias and shallow drill holes into this high level alteration show increasing copper and gold grades with depth. A potential for a deeply buried younger porphyry copper – gold system exists at depth. The importance of the Red Dog resource is its close proximity to the Hushamu Deposit (approximately 8 km). making it a potential source of higher grade feed should subsequent engineering studies show the Hushamu deposit to be economically viable. The reader is cautioned that insufficient engineering studies have been completed on either the Red Dog deposit or the Hushamu deposit to determine the economic viability of mining. Currently, Northisle is carrying out a Preliminary Economic Evaluation incorporating the current Red Dog Resource and the Hushamu deposits.